This past Friday morning, I woke up later than usual, and also felt very tired. My chest hurt, and I had some minor abdominal pain. Once I got to work (about 1/2 hr early), I decided I should probably go to the ER. I dropped Huck off with my dad and headed to the closest ER. I was taken in almost immediately, there are not so many emergency patients at that time of day. I had my own room and had lots of labs and exams throughout the day. My dad joined me when he got out of work, and finally, at 5pm, had a CT scan. My appendix has been noted to be mildly enlarged on every CT, MRI on my abdomen in the last 5 year. It was 1 mm bigger this time. It was also harder to visualized and harder for me to feel pain because it was behind my colon, not in front. The surgeon decided waiting could be more harmful to me than having surgery on Friday Night/Saturday morning. We did not want to risk infection or rupture. When they opened me up, they found my appendix which definitely needed to come out, a not so great looking fallopian tube, and a small amount of bloody ascites, (fluid just hanging out). I have 3 incision sites, and I'm still in a reasonable amount of pain. I am also a little more jaundiced than usual, maybe it will go back down when I start feeling better. I'm sure the extra medications don't help. I will be out of works for 2 weeks, so I can make sure I heal well and not get sick when I go back to work too soon. The most bizarre thing, is that I mentioned that I had a lower abdominal pain and thought it could be appendicitis about 2 weeks ago! I was lucky I didn't wait any longer. One more body part taken out, Pretty soon everything will just be floating around with lots of room due to missing organs. Hoping that this pain will pass soon, and I can get back to normal activities, like walking Huck, going back to work, and driving. 2 Years Since my Adrenalectomy...would I do it again? On September 2nd, 2010, I spent the day in one of the many operating rooms at MGH. I had spent the night before talking and texting to friends and family, after seeing Wicked and going back to the hotel across the street from the hospital. I cried a lot, because of the scary and fairly dangerous surgery ahead, because of the hope that this disease would FINALLY be behind me, and because of the long recovery ahead. I woke up early and walked across the street with my mom, and my dad met us there. 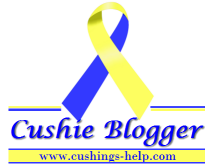 Over the past 8 years, I have spent a few Aprils blogging every day for Cushing's awareness. I will not be blogging daily this year, but don't want to let the month go by without spreading some awareness! April 8th is Cushing's Awareness Day because it is Harvey Cushing's Birthday. Harvey Cushing is the father of modern neurosurgery, and he also was the first to discover Cushing's Disease in one of his patients. You can see a drawing of his patient (Minnie G) in many text book articles about Cushing's. New to Life with Cushing's? Start Here. Happy birthday, Cushing's Help - 15 years old today!